on verso signed, titled twice and inscribed "owned by C.J. Harris" and in graphite "C.S. Band"
Remarkable in the estate of Charles S. Band are the oil studies for iconic Canadian masterworks. Iceberg, Baffin’s Bay North, is the final oil sketch for the McMichael Canadian Art Collection’s masterpiece canvas, Icebergs, Davis Strait. Like other masterpieces in the estate, this oil sketch can be considered the birth of a Canadian icon. At the same time that Harris was exploring the scenery of northern Canada, he had become involved in the theatre scene in Toronto. Hart House Theatre was funded by, and built in honour of, Hart Massey, and was state-of-the-art. Harris was very interested in set design, and more particularly with the way in which theatre affects its audience. His search for other-worldly, mystical, out-of-body experiences found solid footing in theatre, where temporal belief is suspended in order to immerse one’s self in the time, place and setting of the play. So it should be, Harris felt, in viewing art. Harris’s iceberg works have the quality of being set as if they are on a stage. The massive ice forms seem to float in the centre of a space that is somehow, despite its apparent vastness, contained. We are invited to become a part of Harris’s spiritual journey, as theatre-goers are invited to watch a play. How much we get out of it depends on how much we are willing to surrender to what we are seeing. It depends on our imagination and our willingness to participate in the heightened state of being that is being offered to us by this work. In addition to their stage set parallels, Harris’s Arctic works often feel as if the sense of the space in the picture plane is somehow indefinable. Here, we drift or float outside of Harris’s mystical spatial organization. A metaphor for the state of our life in the physical place of existence, the iceberg, by contrast, sits in the spiritual plane. These are two separate places, and in the Arctic works the journey to join Harris requires a leap of faith. The light in Iceberg, Baffin’s Bay North is inexplicably ethereal and comes from an indefinable source, perhaps the icebergs themselves. A glowing blue breaks the surface of the almost black water, indicative of the massive bulk of ice beneath. The iceberg forms are remotely beautiful, an essay in blue, which, being the theosophical colour symbol for faith, asks that we accept them. Thus faith, being the basis of knowledge, will lead us forward. As Harris progressed down his spiritual path, the paintings he created progressed in an evenly matched stride, and it is in the Arctic works that we are required to make the biggest leap of faith. To cross the frigid waters and join Harris at his mystical goal, we must suspend our expectations of landscape art and embrace what Harris offers us: serene, pure, unadorned form. Upon the close of the Arctic period of Harris’s career, he broke entirely with representational landscape and began his foray into pure abstraction. 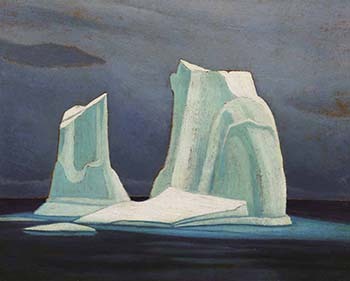 Icebergs, Baffin’s Bay North is offered here for sale for the first time since Charles S. Band acquired this masterwork. For full cataloguing, text and images in PDF format, please click here.